I am not sure that simply requiring a free permit would be prohibited. Cities are allowed to require permits for parades or speakers corners even though there is a free speech right that prohibits government interference. Churches still have to get building permits despite the first amendment exercise of religion clause. I wouldn't be surprised to see an argument by the the Illinois Supreme Court hanging its hat on something like since requiring building permits or special zoning for church construction is permitted in spite of the "free exercise" provision of the 1st amendment, so are the FOID provisions. I hate to say it, but, your logic is a little flawed. A church building doesn't practice any religion. The people who attend it to, and for one to practice their religion they do not require, or need, any building. A similar argument can be made regarding the other example. If the FOID fails, watch for bills going after storage, locking etc, "to keep safe from children", with no exemption if the children have a FOID, because no FOID. The FOID process won't fall.. There's too much prior legal precedent that allows states to enact such nonsense. Eliminating FFL transfer fees on constitutional grounds would be difficult, I think. Obviously they can't require FFLs to perform a service for free, but they can provide for the buyer and seller to bypass the FFL. For example, a system where a potential buyer performs a NICS check on themselves (free of charge), and upon passing gets a code tied to their name good for 30 days. The seller can then check the code to see if it is valid. No fees, no FFL involved, no registration of any kind since no gun info is required nor even is it proof a transfer occurred. That's not how universal background checks work. Precisely. Universal Background Checks is a euphemism in my view for something more foundationally dangerous, to wit: Denying a free-person the right to dispose of their personal property (or not) as they see fit, outside anything the gov't is allowed to regulate because of some hooks they have into commerce. In my view, it's a dangerous step - except for those who will trot out "but... common sense dictates..." - they love the idea. I don't buy it, never will. These are good discussions though & I continue to wish you all some serious luck. Is there an official way to donate to this specific suit? From what I have seen there are others asking this question. Edited by mab22, 28 March 2019 - 09:23 PM. MollyB said before to use the normal subscription link and just make a note Brown Donation! I know, that's why I'm proposing a new method for private sales. They claim they want background checks, this gives it to them. But what they really want is registration for future confiscation and fees to deter purchases. The Feds aren't going to give anonymous people access to NICS just because of IL law. You already have a code based on NICS good for up to 10 years. It's your FOID number. I wasn't talking about Illinois law. Yes, we already have the FOID here. FOID should be voluntary, free, and suffice for private transfers. Yes, we already have the FOID here. FOID should be voluntary, free, and suffice for private transfers. the 5 year issue Foid card was good for private sales. the 10 year issue the ATF said not good. the 5 year issue Foid card was good for private sales. the 10 year issue the ATF said not good.? Originally, Illinois issued FOID for 5 years. They were considered good in lieu of a Brady check for FFL transfers. 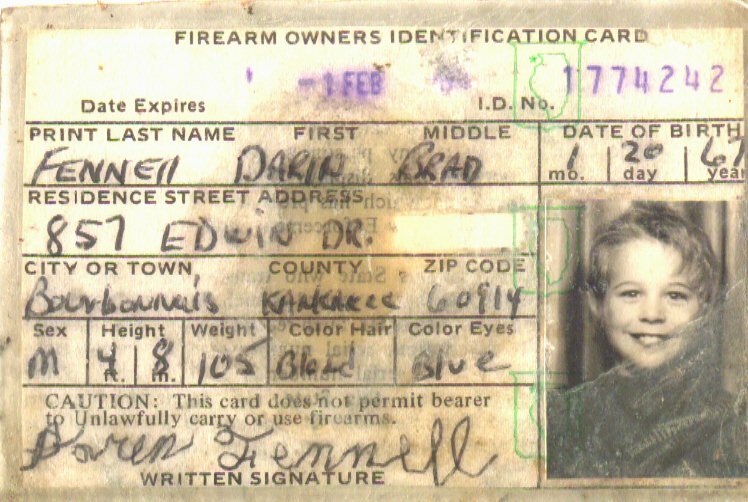 When Illinois changed them to 10 years, the ATF backed off that and started requiring a check at point of sale. Edited by RoadyRunner, 31 March 2019 - 09:57 PM. matth825, thank you for contributing to the Brown Legal Fund! Anyone got a copy of a FOID application from back when it was first instituted? Completed or blank, whatever. Would be an interesting read. Wonder if it blatantly asks race. 2003/2004 ish I think. yes, it does ask for race. I think I might have a FOID card from 1982. What became your card was one corner of the application. If you completed the form in your own handwriting, your FOID card had your own handwriting. Is that kid at least 10 years old? Thats for a realz card? That's crazy, cool, but straight up crazy! Yes, that is how they looked, they literally cut out the section of the application you filled out with your info then took the picture you sent in, generally taking a pair of scissors to your picture (even if you sent it in the perfect size specified) and cutting all 4 sizes as crooked as they could (think preschool level scissor skills) then laminating it all with a plain jane clear laminate that had the state outline imprinted. Everytime I got my new one I had visions of some comedy skit where some kids were making fake IDs with school paste, pens and packing tape. Edited by Flynn, 18 April 2019 - 05:58 PM. I was 10 when I got my first FOID... Dad bought me a .22 for my 10th birthday. I have one of those old cards still, it was actually my second one. It's from the late 80s, I cut the pic out of a picture someone took at a party. I cropped out the beer I was holding lol. You literally had to tape the picture to the proper spot in the application.